On top of the cover of the Aron stood two Keruvim that reflect the love of Hashem to the Jewish people. These Keruvim had the face of a baby. The Midrash likens Hashem’s love for the Jewish people to the love of a parent to a young child. The powerful love of a parent to their child does not depend on the qualities or talents the child possess or lacks. It is unaffected by the child’s behaviour or faults. It is an essential love emanating from an essential bond. A parent loves their child because they are a part of themselves. This is true for all children but most evident in the love for a baby. A baby has not yet developed any talents or achievements. They do not even have the ability to give anything to us and yet we love them deeply and unconditionally. We love them for their very being. Hashem’s essential love for every Jew runs deeper than our observance of Torah and Mitzvos. Hashem loves us because we each possess a soul which is a part of Him. Hashem’s deepest love is for no other reason than that we are. 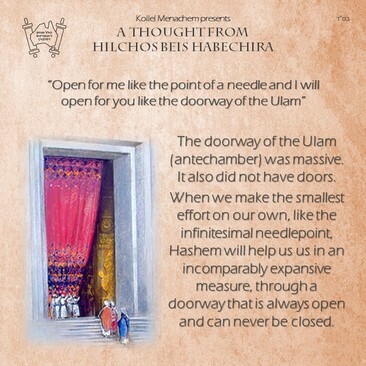 Hashem says to the Jewish people “if you will open for me (an opening) the size of the point of a needle, then I will open for you (an opening) like the doorway of the Ulam”. The Ulam was an antechamber to the Heichal. The other doors and gateways of the Beis Hamikdosh were 20 Amos tall and10 Amos wide (approximately 10x5 metres). The great doorway of the Ulam was double, standing 40 Amos tall and 20 Amos wide! All of the other doorways had doors which would be closed. Due to its sheer size, there was no door in the entrance of the Ulam. The doorway was always open, with only a massive curtain to give privacy. The point of a needle is infinitesimally small. In spiritual growth, if we make even the tiniest opening through our own efforts, Hashem will help us in an incomparably expansive measure. This gateway is always open. All we need to do is take the first smallest of steps. Like the opening of the Ulam, Hashem’s assistance and His blessings of success will not only be expansive, but will flow directly to us, with no doors to stand in their way. The Menorah in the Mishkan was placed on the south wall. The Shulchan stood opposite on the north wall. Nothing could be placed between the Menorah and the Shulchan. Even the incense altar which stood in the centre, had to be positioned to the east so that it would not obstruct. The Torah teaches that the menorah lights should shine אל מול פני המנורה. Most commentators explain that the wicks of the Menorah were positioned so that the flames all shone towards (מול) the central branch of the Menorah. This contains a very deep teaching. Each morning we spiritually connect through prayer and Torah study, represented by the Menorah. We want to take this connection with us to illuminate and inspire us in our worldly pursuits and daily activities, represented by the Shulchan. We have to make sure that nothing obstructs this flow of light so that our workday can also be radiated with the light of spiritual meaning and Divine purpose; by facing the lights of the menorah, our G-dly connection, towards our Shulchan, our daily bread. The Menora, a source of illumination, represents Torah study.